Make sure to label things clearly. So you’ve got your boards packed up nicely (in Part 1), and your bits are stowed away (in Part 2). What else remains? Of course, that’s right, the cards. Almost every game manages to sneak them in somehow, and some games are composed entirely of cards. Fortunately, cards are flat and rectangular, and stack easily. Unfortunately, not all cards are the same size—there’s Euro, American, Mini-Euro, Mini-American, and a few other variations. No worries, though, just keep your wits about you and read this article! Believe it or not, this is 1150 cards in one Dominion box. One of our readers, Todd, pointed us to an excellent example of this method using a Thunderstone box. I don’t own Thunderstone (yet), but it looks like that box even comes neatly divided into card rows. The one downside to this method is that, surprise surprise, game boxes aren’t really designed to be filled to the brim with cards. Doing so definitely puts stress on the box, and you’re risking some major weakening and even tearing. So, you could once again hit up the craft store and get a small plastic container, unsegmented, just for stacking cards. 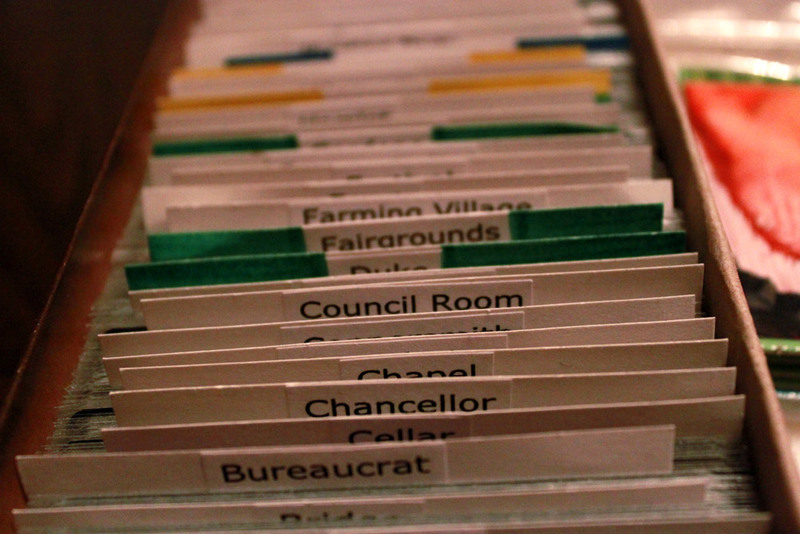 I think it’s generally better to keep cards straight up-and-down instead of tilted to fit, so make sure the box is tall enough at least for cards to fit completely (even if they’re sideways) and that there’s enough room for a couple rows of cards. 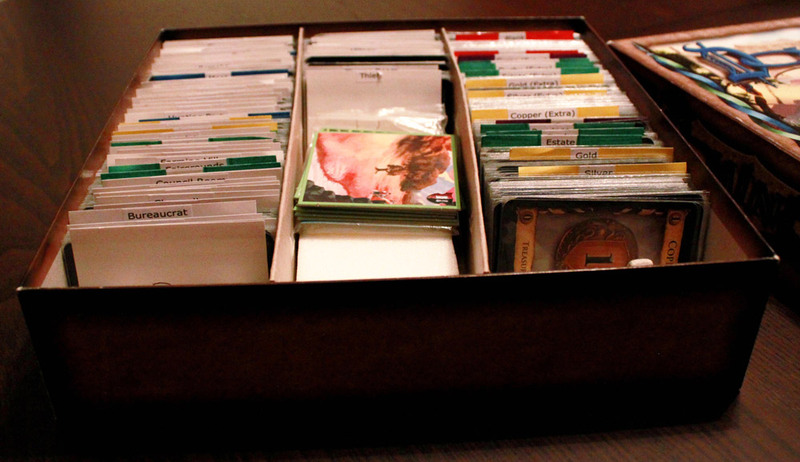 It also helps if the width is close enough so that you don’t have too much extra space on the sides, or your cards will slide around and could easily get disorganized. I don’t like the rounded corners though. Fortunately, our friendly gaming stores have our backs on this one. You can get card boxes in a variety of shapes, sizes, and materials. 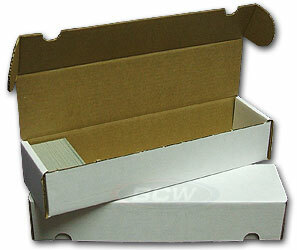 You can get anything from 100-count plastic card storage boxes (usually targeted toward Magic players, but surprise, they work for board game cards too), to leather (or at least leather-like) cases that look really nice, to cheap cardboard boxes specifically designed to hold cards. 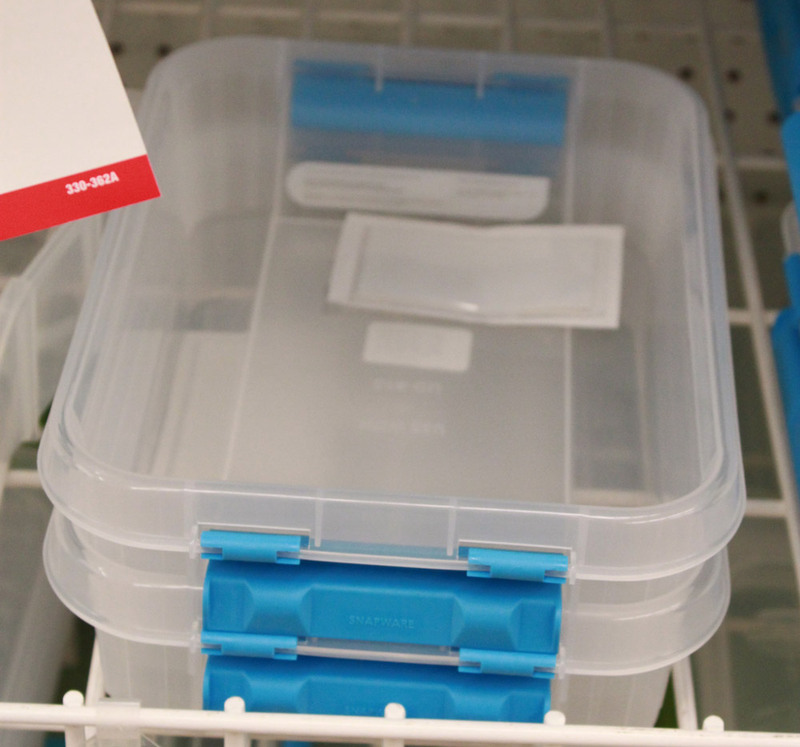 I’ve seen these sturdy boxes in denominations of 200, 400, 500, 800, 1600, and even 3200 count storage space. These boxes are designed to be filled with cards so they’re more durable than your standard game box, and you can pack them in. Incidentally, the 3200 box should be large enough to fit every single Dominion expansion, sleeved, including all the bits and tokens. Card sleeves are an optional accessory—I generally don’t use them (except for Dominion because of all the shuffling), but @FarmerLenny is a serial sleever. Sleeves are usually pretty cheap and can protect your cards in [literally]sticky situations, which are more likely to occur when you’re visiting someone else’s house. Hopefully these ideas will help you out in your travels. If these ideas worked out for you, or inspired you to come up with your own ideas, let us know! And if you haven’t already, make sure to check out part 1: boards and part 2: bits. 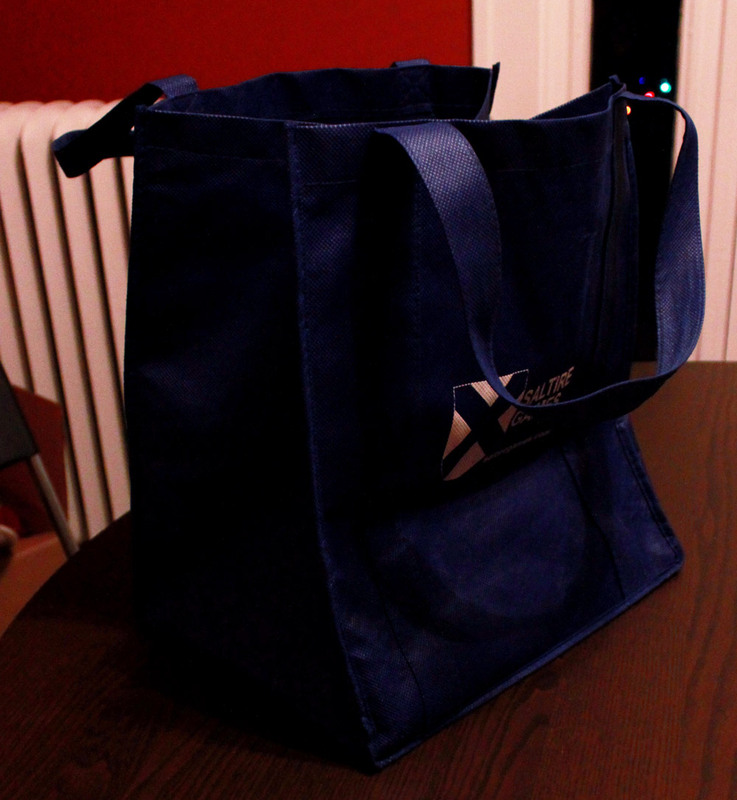 Bonus tip: these bags are AWESOME for carrying boxes of games.